Carlos Padilla's registration as a Land Surveyor #46474 was revoked by the Board on June 30, 2017. The Board conducted an investigation into numerous complaints of fraudulent and deceitful practices, incompetence and negligence. After a hearing took place, the Board determined that Mr. Padilla violated statutes and rules related to his practice as a Registered Land Surveyor in that Mr. Padilla engaged in fraud, deceit, misrepresentation or concealment of material facts in advertising, soliciting, or providing professional services to members of the public, failed to apply the appropriate technical knowledge and skill in his practice, failed to conduct land surveys in accordance with the Arizona Boundary Survey Minimum Standards, failed to sign and seal professional documents and failed to record his surveys in accordance with Arizona State Law. The Board cautions the public that Mr. Padilla is not licensed or qualified to practice land surveying in the the state of Arizona. As the result of allegations received by the Board post revocation, an Injunction was issued by the Maricopa County Superior Court prohibiting Mr. Padilla from practicing land surveying without a license. A violation of this Injunction could place Mr. Padilla in contempt of court. Anyone with information indicating that Mr. Padilla's is engaged in the practice of land surveying is encouraged to contact the Board's Enforcement staff at 602-364-4952 or [email protected]. The Board of Technical Registration is the duly constituted authority for the licensing and control of Alarm Agents and Alarm Businesses within the state of Arizona. Alarm Agents and Alarm Businesses must be licensed with the Board before they can sell, install and/or monitor alarm systems. In an effort to protect the public all applicants for licensure as an Alarm Agent must pass a background check before an Alarm Agent license will be issued by the Board. The Board has the authority to take action against any unlicensed person or business found to be conducting alarm business activities within the state of Arizona. Penalties for unlicensed practice can include a fine up to $2000.00 per occurrence and could result in criminal prosecution. If you suspect that an Alarm Agent or Alarm Business is not licensed by the Board of Technical Registration, call the Board Office at 602-364-4930 and ask to speak with an Enforcement Investigator. A sample BTR Card can be found here. If they do not have a card or a registration number, it is advised to not proceed with any services. It is not uncommon for Alarm Businesses to offer their services and products door to door. If licensed with the BTR, this is perfectly legal and many Alarm Businesses do well in offering their service and products in this manner. However, you the consumer need to be aware of scams and your rights in regards to door to door alarm sales. Here are some tips to help prevent being scammed. Misrepresentation – There have been numerous cases in which alarm salespeople deceived the public through misrepresentation. The salespeople state they are representatives of the customer’s current service provider or an Alarm Business that bought out the customer’s current service provider. They however represent their own services and generally aren’t registered with the BTR. They usually have the customer’s information, making it more plausible for the customer to believe what they say is true. Falsely thinking they were upgrading existing services, customers are shocked to find they now have two alarm service providers and are contractually obligated to both. Verifying registration numbers is a good way to avoid these forms of scams. Ask for credentials. 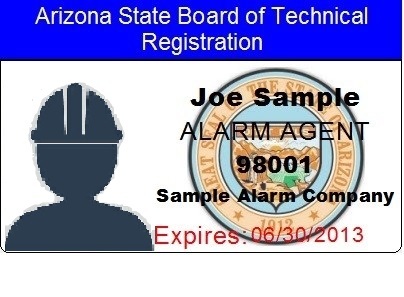 All Alarm Agents and Alarm Businesses in Arizona must be registered with the Arizona Board of Technical Registration. ALWAYS request to see the salesperson’s BTR Card and look for the agent/business registration number. Call your service provider and verify everything the salesperson has told you. Sales Pressure and Hidden Fees– Many scams occur because the customer isn’t given time to think and research the sales pitch. Salespeople aiming to scam you are generally knowledgeable of your basic identity; name, address, phone number, etc. They use this information to break through the barriers of caution most of us put up when a stranger comes knocking on our door. Always be cautious and don’t let your guard down simply because they know your name, this information is much easier to acquire than most people realize. Don’t let the salesperson pressure you into a sale. The salesperson may offer you free services, equipment, and/or upgrades but only if you act quickly, causing a sense of urgency to sign a contract. Allow yourself time to think. There is never a reason to rush, especially when a contract is involved. Check the fine print of the contract and verify that what is stated as free is also written as free. Always know what you will be paying for, how much you are going to pay, and to whom you will be paying. If what is said and what is written doesn’t add up, it is best to send the salesperson on their way. Door to door salespeople aim to sell consumers products that the consumer didn’t seek to purchase, making for a hard sale. Door to door salespeople therefore must push for a sale harder than what most consumers are accustomed to in supermarkets, retail, and other sales venues. This sort of salesmanship can lead to a purchase or the signing of a contract that leaves the consumer with buyer’s remorse. However, for those with buyer’s remorse for signing a contract with an alarm door to door salesperson, fear not, for you can still get out of it if you act fast. If you change your mind within three business days of signing a door to door alarm business contract, you can get out of the contract and receive a full refund. When you sign your contract with a salesperson you should receive three documents, which include: the contract, the receipt, and two copies of a cancellation form. Simply fill out the cancelation form and make sure to sign, date, and mail it within the three-day period. If you did not receive a cancellation form, mail a letter indicating your wish to cancel the contract, making sure to sign, date, and mail the letter promptly. Since it is illegal for the salesperson to omit a cancellation form when making a sale, you have additional time to cancel.